WARNING: This post is longer than normal. You may want to click here for the PDF version. Hanukkah is an annual festival celebrated on eight successive days, during which no eulogies are delivered, nor is fasting permitted. It begins on the 25th day of Kislev, the third month of the Jewish calendar, corresponding, approximately, to December in the Gregorian calendar. This year (2017), Hanukkah starts at sundown on December 12th. 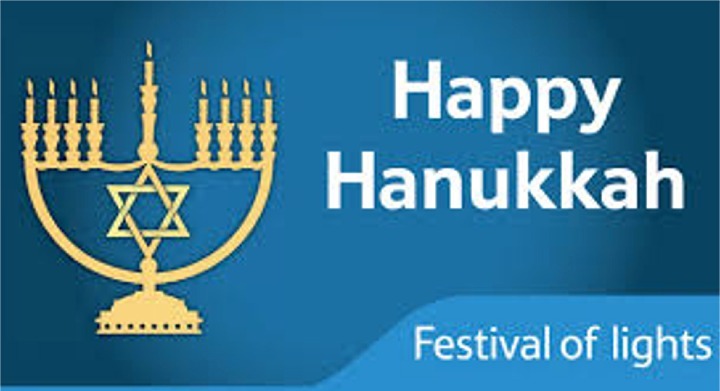 Hanukkah is also known as the Festival of Lights, Feast of Dedication, and Feast of the Maccabees. Pushed to their limit, the Jews revolted. Chapter two of 1 Macc introduces the man credited with leading the revolt: “1In those days Mattathias, son of John son of Simeon, a priest of the family of Joarib, moved from Jerusalem and settled in Modein. 2He had five sons … [including] 4Judas called Maccabeus. …6He saw the blasphemies being committed in Judah and Jerusalem, 7and said, “Alas! Why was I born to see this, the ruin of my people, the ruin of the holy city, and to live there when it was given over to the enemy, the sanctuary given over to aliens?8 Her temple has become like a person without honor;9 her glorious vessels have been carried into exile. Her infants have been killed in her streets, her youths by the sword of the foe.10 What nation has not inherited her palaces and has not seized her spoils? 11 All her adornment has been taken away; no longer free, she has become a slave. 12 And see, our holy place, our beauty, and our glory have been laid waste; the Gentiles have profaned them. 13 Why should we live any longer?” The rebellion had begun. What Do The Letters On The Dreidel Stand For? Yeshua celebrated Hanukkah aka the Feast of Dedication in most English translations of Yochanan 10:22, By whatever name it is always appropriate to remember the redemption of God’s people at the hands of God. Rather than re-posting my usual post on this special Jewish Holiday, I thought I would post this excellent explanation from FaithGateway. This year, 2016, Hanukkah begins at sundown on Christmas Eve, December 24th. Everyone has some awareness of the holiday called Hanukkah, because of its proximity to Christmas. You hear people say, “Merry Christmas and Happy Hanukkah”. Many Jews even exchange gifts within their respective families, primarily with the children because of the influence of Christmas. As we all know, it is very much a Jewish celebration, but should it have any interest or significance for Christians? The purpose and the traditions of this festival are so intriguing, that Christians should appreciate Hanukkah more than a passing acknowledgment of the season. Jewish celebrations are packed full of meaningful rituals and observances, which serve as wonderful illustrations of spiritual truths. When the traditions point in someway to Jesus, Christians should especially take note. Unlike the seven annual feasts or festivals of Passover to Tabernacles, Hanukkah was initiated by humans themselves, rather than God. The seven Biblical feasts in Leviticus 23 are called “the Lord’s appointed times”. Hanukkah on the other hand was created in the mind of man. This by no means should minimize the significance of the observance, because it is honoring God. After all, we celebrate Easter, Thanksgiving and Christmas, which were all established by man as very important and meaningful holidays. Hanukkah is a holiday that lasts eight days to remember and celebrate two important happenings in history that were really connected in one major event. The first was the victory that the Hasmonean Jews had over the Syrian Greeks in a revolt led by the Maccabean brothers in 164 B.C. The second event, which is also the primary event in the remembrance, is the eight days of the cleansing and rededication of the temple after the Gentiles had desecrated it. The word Hanukkah actually means “dedication”. Daniel 8:9-12, Daniel 8:23-25 and Daniel 8:11:21-35 prophesied that a leader would rise up and cause persecutions to those living in Israel. This man was Antiochus IV Epiphanes, who was a prefiguring of the coming Antichrist of the last days. He did many deplorable things, such as prohibiting the Jews from practicing their laws, and in addition to that, he sacrificed a pig on the altar. Antiochus even erected a statue of Zeus right outside the temple. He demanded that the Jews worship his false god. He even killed the Jews if they refused to eat pork. One can understand why he is called a despicable person in Daniel’s prophecy. From then on the Jews called this festival the Festival of Lights. To this day Jews focus on the cleansing of the temple and the lighting of the menorah. The menorah has nine candlesticks. The one in the middle that is elevated above the others is called the “shammus”, which means “servant”. On the first night the servant candle is used to light the first candle on the far right. Before each subsequent candle lighting, only the first two blessings are recited. On the second night the servant candle is used to light the first candle again and then the second one next to it. This procedure is repeated each night until all eight candles are lit. The miracle according to tradition is interesting, but there are other elements Christians need to appreciate that are even more applicable today. The first application we should take notice is that “eight” in the Hebraic numeric system points to a “new beginning”. This is very poignant to the Christian, because it reminds us that, after we are cleansed by the blood of Christ at salvation, we have a new beginning as the temple of the Holy Spirit and a new life in fellowship with our Lord Jesus Christ. Secondly, it is fascinating that the middle elevated candle is called the “servant” that brings light to the other candles. It reminds us of the messianic prophecy of Isaiah 53, where the Messiah is called the Servant. Jesus, our Messiah, is our sole source of light. Another very interesting fact about Hanukkah is when it is observed on the calendar, which is the time of year that the nights are the longest, in other words, the darkest time of the year. In my book, Unlocking the Secrets of the Feasts, in the chapter about the Feast of Tabernacles, I explain in detail the evidences that Jesus was born during the time of the Feast of Tabernacles and conceived in the timeframe of Hanukkah. The evidences are derived from the Gospel of Luke and the Hebraic calendar. The Feast of Tabernacles, which looks forward to the Messiah dwelling or “tabernacling” with mankind in the future Kingdom, is called the “Show of Lights”, whereas Hanukkah is called the “Festival of Lights”. When Jesus declared that He was the “Light of the World”, He had those two festivals surrounding the event of His birth as bookends. Finally, when we see the progressive lighting of the menorah getting brighter each evening, Christians can remember that we shine more and more of Christ’s light each day as we grow and walk in His light. 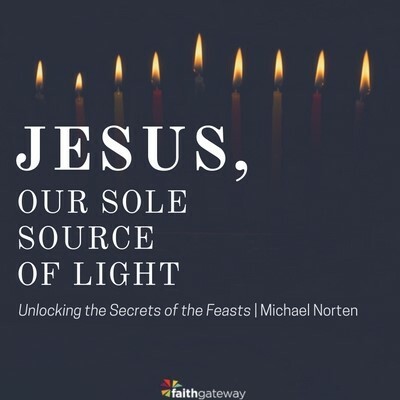 Original devotion by Michael Norten, author of Unlocking the Secrets of the Feasts for FaithGateway and Devotional Daily. Tomorrow, Thursday, April 16th we will be observing Yom Hashoah, the Day of Remembrance of the Holocaust. Although this is not an Appointed Time scripturally, it certainly is a time when we need to pause and remember the deliverance of our Jewish (and gentile) brothers and sisters from the atrocities of our ancestors. Click here for a PDF version of a Yom Hashoah Service. Hanukkah – 5775 (2014) Should Christians Observe Hanukkah? You may want to click here for PDF version. Hanukkah is an annual festival celebrated on eight successive days, during which no eulogies are delivered, nor is fasting permitted. It begins on the 25th day of Kislev, the third month of the Jewish calendar, corresponding, approximately, to December in the Gregorian calendar. This year (2014), Hanukkah starts at sundown on December 16th. Hanukkah is also known as the Festival of Lights, Feast of Dedication, and Feast of the Maccabees. Hanukkah is not one of the feasts or festivals commanded in the Torah in Leviticus 23 (Rosh Hashanah, Yom Kippur, Sukkot, Pesach, and Shavuot) but, like Purim and Yom HaShoah (The Day of Remembrance for those who died in the Holocaust) it is Rabbinically prescribed. To learn some of the details of the Hanukkah story, we have to turn to the apocryphal books of I & II Maccabees. While the books are not a part of the established Hebrew or protestant canon of Scripture, they are considered authoritative accounts and are useful historical documents which can be read for example of life and instruction of manner, yet not for the establishment of doctrine. In 168 BC, on a date corresponding approximately to December 25 in the Gregorian calendar, the temple was dedicated to the worship of the pagan god Zeus by order of Antiochus, who forbade the practice of Judaism. An altar to Zeus was set up on the high altar. Antiochus also ordered that a pig be sacrificed on the holy altar and insisted on being called ‘epiphanes’ which means “god manifest”. Pushed to their limit, the Jews revolted. Chapter two of 1 Maccabees introduces the man credited with leading the revolt: “1In those days Mattathias son of John son of Simeon, a priest of the family of Joarib, moved from Jerusalem and settled in Modein. 2He had five sons … [including] 4Judas called Maccabeus. …6He saw the blasphemies being committed in Judah and Jerusalem, 7and said, “Alas! Why was I born to see this, the ruin of my people, the ruin of the holy city, and to live there when it was given over to the enemy, the sanctuary given over to aliens?8 Her temple has become like a person without honor;9 her glorious vessels have been carried into exile. Her infants have been killed in her streets, her youths by the sword of the foe.10 What nation has not inherited her palaces and has not seized her spoils? 11 All her adornment has been taken away; no longer free, she has become a slave. 12 And see, our holy place, our beauty, and our glory have been laid waste; the Gentiles have profaned them. 13 Why should we live any longer?” The rebellion had begun. In 165 BC, Judas Maccabee recaptured Jerusalem, he had the temple purged and a new altar put up in place of the desecrated one. The temple was then rededicated to God with festivities that lasted eight days. A year later the Rabbis designated these days as Yomim Tovim (Holidays) on which praise and thanksgiving were to be said. When the Greeks entered the Sanctuary, they defiled all the oils, and when the Maccabees defeated them, they searched and found only one remaining jar of oil with the seal of the Cohen Gadol (the High Priest). According to tradition, only a one-day supply of non-desecrated olive oil could be found for the rededication, but that small quantity burned miraculously for eight days. Jews commemorate this event by lighting candles for the eight nights of Hanukkah. Questions have arisen over the years about the actual miracle of the oil. If there was enough oil in the flask that was found to last one day, then the miracle of the oil lasting was really only a miracle for the latter seven of the eight days. Yet, we know that the Jews celebrate Hanukkah for eight days! What is the reason behind the eight-day celebration? 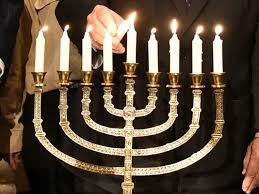 Those who were preparing the Menorah for lighting knew that it would take eight days until new oil could be obtained. They therefore divided the flask into eight parts, so that at least the Menorah would be lit every day, albeit not for the entire day. A miracle occurred and the small amount of oil that was placed in the Menorah each day lasted an entire day. Hence, there was a miracle on the first day as well. On the first night, the entire contents of the flask were emptied into the Menorah. This would enable the Menorah to be lit for an entire day. When the Menorah was checked on in the morning, it was discovered that none of the oil burned up, and the Menorah was still full, although the flame was lit. This miracle occurred for each of the days. Hence, the first day when the oil did not burn up was miraculous as well. To be kosher, the eight candles of the menorah must be in a straight line with the Shamash, or middle candle, a little bit above them. Any menorah that is fancily shaped in a circle or square…is not permitted to be used since the candles must be in a straight line and none may be higher or lower than the others, except for the Shamash. There must also be enough space between one candle and another so that the flames of each are not intermingled. On the first night of Hanukkah, one candle is lit and on each successive night another candle is added until by the eighth night all the candles are lit. When one lights the candle on the first night, one lights the candle on the extreme right. The following night he adds one immediately to the left and kindles it first. He then turns to the right and kindles the light of the previous night. He follows the same procedure each night always adding from right to left but always lighting from left to right. The reason for this procedure is that the additional light recalls the greatness and growth of the miracle. Like most of the other festivals, there is specific food associated with the celebration of Hanukkah. There is a custom to eat dairy products and cheese on Hanukkah. This custom stems from the heroism of Yehudis, of the Chashmonean family. Yehudis, a beautiful woman, was taken by the leader of the Greek troops. While she was with the Greek officer, Yehudis fed him a dish cooked with cheese so he would become thirsty. Once he became thirsty, she gave him wine to drink so he would become drowsy. When he fell asleep, she took his sword and beheaded him. She then carried his head back to Jerusalem and displayed it, so that the Greek troops would become demoralized. Her plan worked, and the troops retreated. There is a custom as well to eat foods cooked in oil. The reason for this custom is because by eating these foods, we are reminded of the miracle that occurred with the oil. Two of the most common foods associated with this custom are “Latkes”, potato pancakes and “Sufganiot,” which are doughnuts (or flour pancakes), both of which are fried in oil. On Hanukkah, there is a custom to play with a four-sided top. It is said that the Jewish children of Judea, during the Hellenistic period, wanted to study the Torah, but the anti-Semitic policies of Antiochus made this difficult. They came up with a creative answer: they would study the scrolls in the streets until a foreign soldier came. Then they would quickly hide the scroll, bring out the dreydels, and pretend to be engrossed in a game of tops! When the soldier left, the Torah study would begin again. Traditionally, Hanukkah was one of the only times that rabbis permitted games of chance. Before play, each player puts a certain number of coins, candies, or another object into a “pot.” One player then spins the Dreydel. Each of the four sides of the Dreydel bears a letter of the Hebrew alphabet, and the side that lands up when the Dreydel stops spinning indicates which part of the pot the player will receive. The Hebrew letter nun indicates “nothing”; the letter gimel, “all”; hay, “half”; and shin, “put in” or “match the pot.” Children also play by guessing which letter will appear when the Dreydel stops, with the winner claiming the pot. There have been many times that oppressive nations sought to destroy the Jewish people, and they were miraculously saved from their designs. Upon two of these occasions (Purim and Hanukkah), the Rabbis saw fit to establish an annual holiday commemorating the miraculous salvation, providing us with an opportunity to remember Adonai’s kindness and thank him for His salvation. Hanukkah is observed in a spiritual way, with expressions of thanks and praise to Adonai. The oppressive acts of Antiochus and the Syrian-Greeks, were of a different nature. Had the Jews agreed to abandon their own customs and beliefs, and become integrated into the Greek lifestyle, they would have been left alone. Their oppressors sought only to destroy them spiritually. And so, when Adonai granted the Maccabees victory over the Syrian-Greeks, he was preserving the spirituality of the Jewish nation. Our appreciation for this gift, the opportunity to serve Adonai and recognize him as our God, is best acknowledged through spiritual expressions of His praise. Hanukkah is a holiday on which we celebrate our freedom from religious oppression. The Syrian-Greeks’ oppression of the Jews was not physical. They did not want to annihilate the Jews. They did, however, want to annihilate Judaism. They applied whatever pressure they could to “convince” the Jews to abandon the ways of their fathers. Many Jews indeed succumbed to this pressure. Hellenism made inroads into the Jewish communities. At times, the pressure to give in to popular culture was overwhelming. Ultimately, the Jews withstood this pressure and fought with all their might against it. The Jews were victorious. Today, all that we know of the Syrian-Greeks is from history books, while Judaism lives on. When we look at the olive oil burning bright on Hanukkah, we should be reminded that the olive is a symbol of the fortitude our spiritual forefathers had. They withstood the pressure to deviate from the word of God. We should allow the light of the olive oil to inspire us to stand steadfast against the pressure, what ever it may be, to deviate from the word of God. So now, we come to my original question, should Christians observe Hanukkah? Although the story of Hanukkah is contained in the apocryphal book of I Maccabees, it is foretold in the Book of Daniel 8:21ff. Daniel has seen a vision and the Angel Gavri’el is giving the interpretation. Surprisingly, the clearest mention of Hanukkah in the Bible is in the Brit Hadashah in John 10:22. This brings us to the first reason believers in Yeshua should celebrate this holiday – it appears that Yeshua may have celebrated it! At the least, He observed the celebration in the same Temple that had been cleansed and rededicated just a few generations earlier under the Maccabees. Because Hanukkah is a celebration of deliverance, it has also become a time to express messianic hope. The festival commemorates a time when the true worship of God was restored in Jerusalem. Certainly, all believers in Yeshua have important reasons to remember this Feast of Dedication. Messiah, our deliverer, has come! We light these candles because of the miracles, deliverance and wonders you performed for our fathers by means of your holy priests. During the eight days of Hanukkah these lights are sacred. We look at them in order to remember to thank you for your miracles, deliverance and wonders. In the days of the Hasmonean, Mattityahu ben Yochanan, the great priest, and his sons, when a wicked Hellenistic government rose up against Israel, your people, to make them forget your Torah and to break the laws you gave, you with great mercy stood by them in the time of their distress. You championed their cause, defended their rights and avenged their wrong. You delivered the strong into the hands of the weak, the many into the hands of the few, the impure into the hands of the pure, the ungodly into the hands of the godly and the arrogant into the hands of the students of Torah. You made a great and holy name for yourself in the world, and for your people Israel you performed a great deliverance. Where upon your children entered your sanctuary, cleaned the Temple, purified your house, kindled lights in your holy courts and instituted these eight days of Hanukkah for thanksgiving and praise to your great name.